aFrom the Departments of Radiology and Biomedical Imaging (S.W.H., T.T., D.L.C., M.R.A., F.S., P.M., C.F.D., R.T.H., V.V.H. )bNeurological Surgery (C.F.D., R.T.H., M.T.L., V.V.H. )cNeurology (C.F.D., R.T.H., V.V.H. )dAnesthesia and Perioperative Care (C.F.D., R.T.H., V.V.H. ), University of California, San Francisco, San Francisco, California. BACKGROUND AND PURPOSE: A minority of intracranial dural arteriovenous fistulas progress with time. We sought to determine features that predict progression and define outcomes of patients with progressive dural arteriovenous fistulas. MATERIALS AND METHODS: We performed a retrospective imaging and clinical record review of patients with intracranial dural arteriovenous fistula evaluated at our hospital. RESULTS: Of 579 patients with intracranial dural arteriovenous fistulas, 545 had 1 fistula (mean age, 45 ± 23 years) and 34 (5.9%) had enlarging, de novo, multiple, or recurrent fistulas (mean age, 53 ± 20 years; P = .11). 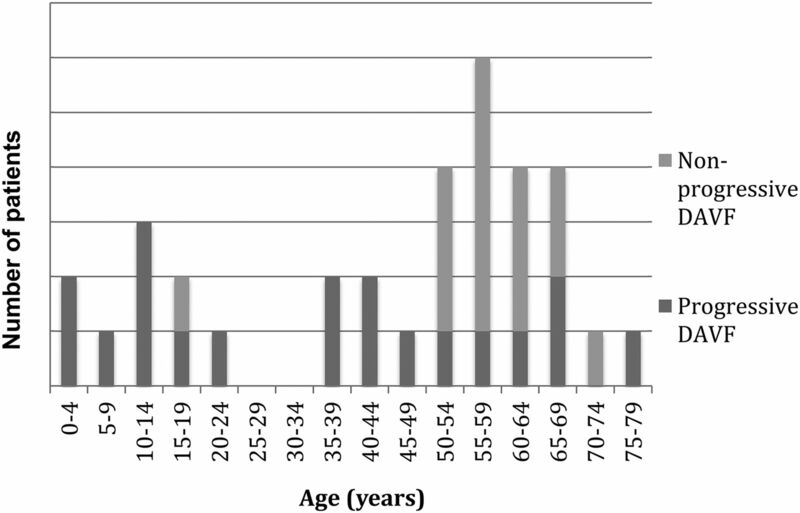 Among these 34 patients, 19 had progressive dural arteriovenous fistulas with de novo fistulas or fistula enlargement with time (mean age, 36 ± 25 years; progressive group) and 15 had multiple or recurrent but nonprogressive fistulas (mean age, 57 ± 13 years; P = .0059, nonprogressive group). Whereas all 6 children had fistula progression, only 13/28 adults (P = .020) progressed. Angioarchitectural correlates to chronically elevated intracranial venous pressures, including venous sinus dilation (41% versus 7%, P = .045) and pseudophlebitic cortical venous pattern (P = .048), were more common in patients with progressive disease than in those without progression. Patients with progressive disease received more treatments than those without progression (median, 5 versus 3; P = .0068), but as a group, they did not demonstrate worse clinical outcomes (median mRS, 1 and 1; P = .39). 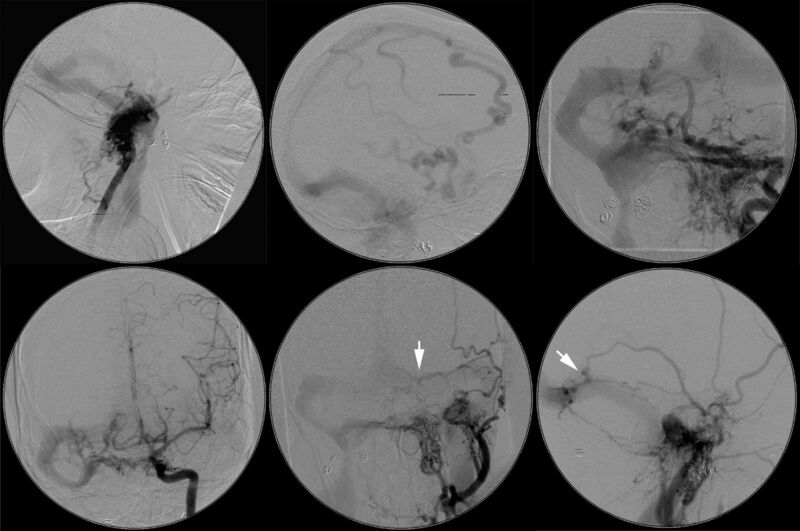 However, 3 young patients died from intracranial venous hypertension and intracranial hemorrhage related to progression of their fistulas despite extensive endovascular, surgical, and radiosurgical treatments. CONCLUSIONS: Few patients with dural arteriovenous fistulas follow an aggressive, progressive clinical course despite treatment. Younger age at initial presentation and angioarchitectural correlates to venous hypertension may help identify these patients prospectively. Intracranial dural arteriovenous fistulas (DAVFs) are rare arteriovenous shunts involving the epidural space and adjacent dura mater, which receive arterial supply from meningeal vessels and drain directly to dural venous sinuses or cortical veins.1 In the early days of cerebral angiography, DAVFs were considered a subset of AVMs: Newton and Cronqvist2 classified AVMs by arterial supply as pure dural, mixed pial-dural, or pure pial malformations. Unlike brain AVMs, however, DAVFs are most often thought to be acquired (as opposed to congenital), and DAVFs lack a nidus of vessels in the brain parenchyma. DAVF is also distinguished from nongalenic pial arteriovenous fistula by its fistula location in the dura. A small number of patients with DAVFs respond poorly to conventional therapies and demonstrate progressive neurologic and angiographic deterioration with enlargement of existing fistulas, formation of de novo fistulas, and development of features that increase the risk of intracranial hemorrhage.7 Reports of such rapidly progressive “runaway” DAVFs are scarce. Only a few cases have been published in the past 15 years; therefore, the pathogenesis, presentation, clinical course, and treatment remain unclear.4,8⇓⇓⇓–12 The purpose of this single-institution retrospective cohort study was to compare the clinical characteristics, angioarchitecture, and treatment outcomes of patients with progressive (enlarging fistulas or developing de novo fistulas) versus nonprogressive (recurrent original fistula or the presence of multiple unchanging fistulas) intracranial DAVFs. In this institutional review board–approved study, a neurointerventional radiology data base was used to identify 579 subjects diagnosed with or treated for intracranial DAVFs at the University of California, San Francisco between 1986 and 2013 (Fig 1). Data were cross-referenced with a larger institutional brain AVM data base for cases between 2000 and 2012. Imaging reports and medical records of 141 patients who underwent ≥2 cerebral DSAs were reviewed. Thirty-four patients with angiographically confirmed multiple, recurrent, enlarging or de novo DAVFs were identified. This search and classification approach was taken to be certain that fistula progression or nonprogression could be confirmed by angiographic images acquired at our institution by using selective DSA techniques that have been standard during a long period. Baseline demographic and clinical variables were recorded for each subject (Table 1). Angioarchitectural characteristics noted from initial pretreatment angiograms are outlined in On-line Table 1. Treatment and outcome variables are outlined in Table 2, and detailed information is included in On-line Table 2. Preintervention diagnostic cerebral angiograms and accompanying reports were available for 32 of 34 patients. Angiographic images for these 32 patients were reviewed and scored (S.W.H., T.T., D.L.C.) according to a structured data-collection sheet previously developed for brain AVMs and nongalenic pial arteriovenous fistulas and modified to highlight features of DAVFs.13,14 Two patients were reviewed by using only structured angiography reports, which are of the same format and authored by the same group of angiographers (S.W.H., D.L.C., C.F.D., R.T.H., V.V.H.) for the entire study period. Individual DAVFs were graded according to the Borden-Shucart and Cognard scales.15,16 “Multiple” was defined as the simultaneous occurrence of ≥2 fistulas at anatomically different locations. “Recurrent” was defined as the recanalization of a fistula at its original location on follow-up DSA after apparent initial angiographic cure. “De novo” was defined as the development of ≥1 fistula during treatment or on follow-up DSA that was not detected on initial DSA. “Enlarging” was defined as the interval enlargement, increase in arterial flow, recruitment of new arterial feeders, or worsening of the venous drainage pattern of an existing fistula during treatment or on follow-up. When we combined these descriptions for analysis, the progressive fistula group included patients with enlarging and/or de novo fistulas and the nonprogressive group included patients with unchanging multiple or recurrent fistulas. Intracranial venous pressures—as measured via microcatheters in situ during embolization procedures—were reviewed when available in DSA reports. Brain CT or MR imaging was reviewed for evidence of acute or prior hemorrhage, hydrocephalus, encephalomalacia, and intracerebral calcifications. Management of DAVFs at our institution is based on the expected clinical course of the lesion. Low-grade fistulas with antegrade dural sinus drainage and no CVD are managed conservatively, though endovascular repair is often considered for patients presenting with debilitating symptoms such as severe pulsatile tinnitus. DAVFs with CVD are treated in order to lower the risk of intracranial hemorrhage.12,17⇓–19 Endovascular procedures are the treatment of choice for most lesions at our institution except in cases in which CVD cannot be eliminated by endovascular embolization, in which case an operation is undertaken.5,6 During the study period, patients were treated by endovascular intervention, a combination of endovascular and surgical intervention, radiosurgery, or observation. In the absence of clinical worsening, we typically perform DSA and clinical follow-up of DAVFs without CVD at 12 months following treatment and of DAVFs with CVD at 3 months following curative treatment. Medical records from each patient's last clinical follow-up were assessed for neurologic or developmental disability by 2 investigators (T.T., S.W.H.). The mRS of neurologic disability was used for retrospective classification of initial clinical function and ultimate clinical outcome in all patients. Good clinical outcome was defined as an mRS of 0–2. At the time of last follow-up, records and images were assessed for evidence of change since initial presentation by 2 investigators (T.T., S.W.H.). Follow-up duration was the time from clinical presentation to the last clinical or imaging report. In a descriptive analysis, subjects were stratified by DSA findings into those with progressive DAVFs compared with those with nonprogressive DAVFs. Student t tests were used to compare normally distributed continuous data, Wilcoxon rank sum tests were used to compare ordinal data, and Fisher exact tests were used to compare proportions. Descriptive statistics and Student t tests were calculated in Excel for Macintosh 2011 (Microsoft, Redmond, Washington). Risk ratios, 95% confidence intervals, odds ratios, and Wilcoxon rank sum and Fisher exact tests were performed in STATA SE, Version 12.1 (StataCorp, College Station, Texas). Multiple, recurrent, de novo, or enlarging DAVFs were present in 5.9% of the 579 patients diagnosed with intracranial DAVFs at our hospital during the study period. Patients with multiple DAVFs presented clinically at a mean age of 45 years (range, 2 months to 87 years), whereas patients with single fistulas presented at a mean age of 53 years (range, 0 days to 87 years, P = .11). Of the 34 patients included for further analysis, 12 (35%) were male and 22 (65%) were female. Patients with progressive DAVFs presented at a younger age compared with patients with nonprogressive fistulas (38 years versus 59 years, P = .0059). Whereas all 6 children (18 years of age or younger at time of initial presentation) in our cohort had fistula progression, only 13/28 adults (46%, P = .02) had fistula progression (Fig 2). Baseline patient characteristics and clinical presentations are presented in Table 1. Age of diagnosis for patients with progressive-versus-nonprogressive fistulas. Initial clinical presentation did not differ significantly between subjects with progressive DAVFs and those with nonprogressive DAVFs. Headache and pulsatile tinnitus were the most common symptoms in both groups and occurred at similar rates. The likelihood of aggressive presentation, such as seizure or intracranial hemorrhage, did not differ between the 2 groups. Similarly, the median presentation mRS did not differ between subjects with progressive DAVFs and those with nonprogressive DAVFs. Prior head trauma also occurred at similar rates in both groups. Multiple and progressive DAVFs. 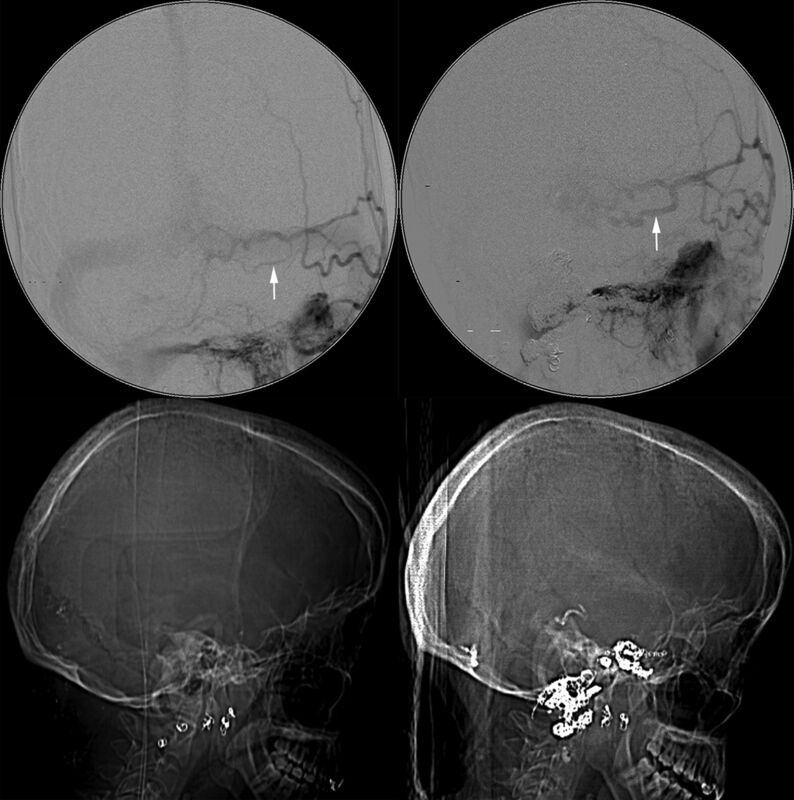 A 25-year-old female patient with large skull base DAVFs refractory to multiple endovascular treatments. She was initially diagnosed at 18 years of age and died of intracranial hemorrhage 6 years later in the setting of intractable intracranial venous hypertension. 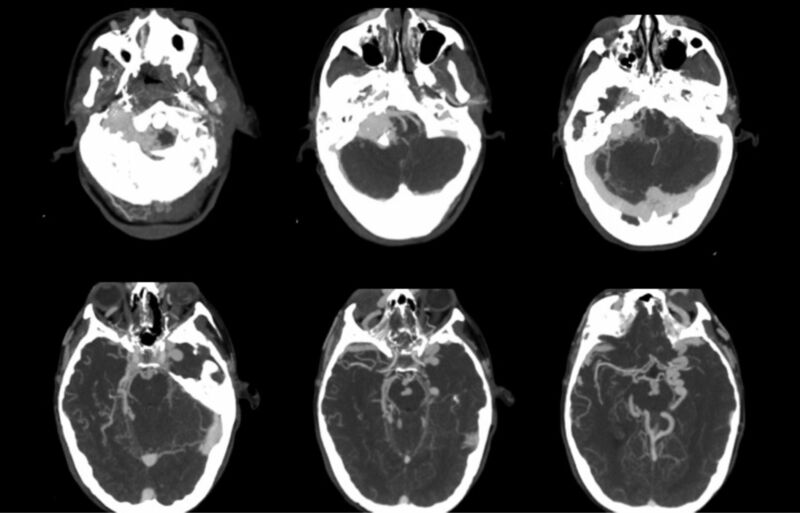 CTA images demonstrate an extensive skull base vascular abnormality with dilated cortical veins suggestive of intracranial venous hypertension. Multiple and progressive DAVFs. Same patient as in Fig 3. DSA images before treatment at our institution but 4 years after initial proximal coil embolization of external carotid artery feeders below the skull base at an outside institution demonstrate multiple skull base fistulas associated with venous hypertension, cortical venous reflux, venous sinus dilation, and a jugular bulb outflow stenosis (between white arrows). (Upper row: right vertebral artery lateral, right vertebral artery lateral, left vertebral artery anteroposterior; lower row: left ICA anteroposterior, left external carotid artery anteroposterior, left external carotid artery lateral). A middle meningeal artery to the torcular fistula indicated by the white arrows is shown in greater detail in Fig 5. Multiple and progressive DAVFs. Same patient as in Figs 3 and 4. DSA demonstrates progression of a left middle meningeal artery to a torcular DAVF with interval enlargement of a feeding artery (arrow in upper left panel versus arrow in upper right panel) during 7 months. Lateral CT scanograms obtained at the same time as DSA provide an overview of treatment with interval deposition of embolic coils and n-BCA glue (lower left versus lower right panel). Treatments are described in Table 2. Patients received between 2 and 19 endovascular, surgical, and/or radiosurgical treatments. Subjects with progressive DAVFs underwent more treatment procedures than did subjects with nonprogressive fistulas (median, 5 versus 3; P = .0068). There was no significant difference in the type of embolic materials used to treat progressive fistulas compared with those used for nonprogressive fistulas. The median follow-up time was 2.5 years (range, 56 days to 23.3 years) for all patients. Median follow-up was longer in patients with progressive fistulas (3.9 years) than in those with nonprogressive fistulas (1.4 years), but this difference did not reach statistical significance (P = .37). Angiographic progression from lower risk to higher risk venous drainage on the basis of the Borden-Shucart or Cognard classification was noted in 9% of all patients. Good clinical outcome, defined as a last mRS of 0–2, was achieved in 74% of all patients. Median change in mRS did not differ between subjects with progressive fistulas compared with those with nonprogressive fistulas. Three deaths occurred in the progressive DAVF group (16%) due to intracranial hemorrhage, compared with no deaths among subjects with nonprogressive DAVFs (P = .24). DAVFs are rare and present a variable clinical risk to patients.25,26 Although many DAVFs are curable by embolization,27⇓–29 some DAVFs require surgery or a combination of embolization and surgery for effective treatment.30 Despite the overall good success rates of treating even complex DAVFs by using modern techniques,31 progressive DAVFs, by definition, have eluded cure. Such lesions can often be palliated with stabilization or regression of clinical symptoms, but a minority of DAVFs progress and result in significant morbidity. As reported in the current study, a small number of progressive intracranial DAVFs are ultimately fatal. Large series of DAVFs indicate that multiplicity is uncommon, with rates between 6.7% and 8.1%.19,28,31,32 The frequency of de novo or enlarging progressive DAVFs is difficult to assess due to the paucity of published data.33⇓–35 In the present study, 19 (3.2%) of 579 patients had de novo or enlarging progressive fistulas, supporting the contention that such lesions are exceedingly rare. Our series may under-report the number of multiple DAVFs (15 of 579; 2.6%), given our approach requiring follow-up DSAs at our own institution with reviewable images. 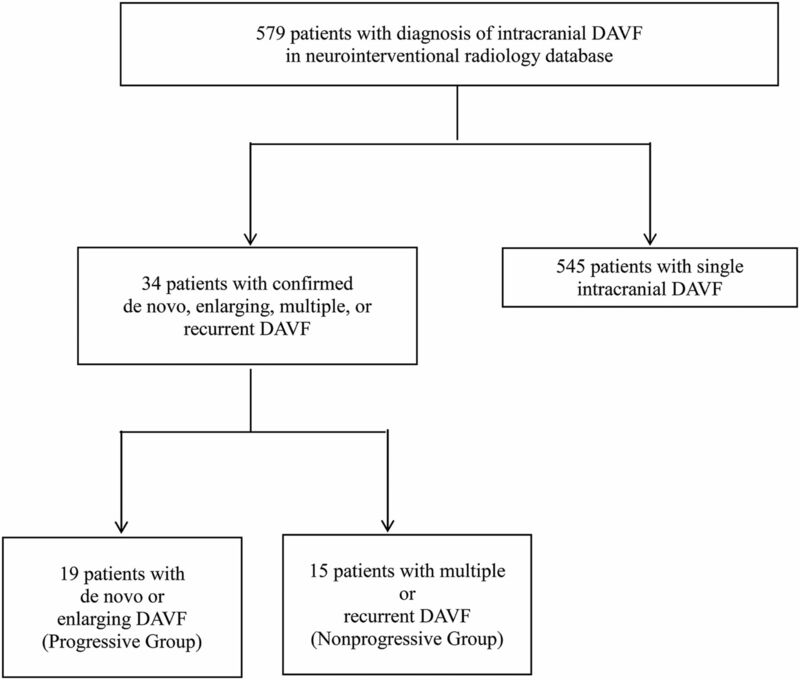 Multiple synchronous DAVFs may be associated with a more aggressive clinical presentation compared with solitary lesions.19,28,32 In our cohort of patients with multiple, recurrent, de novo, or enlarging DAVFs, we observed relatively high rates of intracranial hemorrhage (26%), cranial neuropathy (47%), and other focal neurologic deficits (32%). Fistulas that eventually progressed with enlargement or de novo fistula formation were not more likely to present initially with aggressive symptoms, suggesting that neurologic symptoms at presentation cannot necessarily be extrapolated to predict a malignant clinical course. A bias in our study, however, is that we would treat DAVFs with CVD at presentation aggressively at our institution, seeking prompt cure to reduce the risk of subsequent intracranial hemorrhage. Thus, one would expect that lesions with CVD at initial presentation would preferentially be extirpated and thus not persist to have progression in follow-up studies. Of course, the most complex lesions with CVD were not curable with embolization, surgery, or radiosurgery and thus did persist to show progression on follow-up. Cortical venous drainage is a well-established risk factor for aggressive clinical presentation15,16,36,37 and is related to poor clinical outcome in untreated lesions: Venous hypertension can lead to not only cortical edema and seizures but, more seriously, vein rupture and intracranial hemorrhage.38 Few studies to date have explored the prognostic significance of CVD in the setting of definitive management.39 Our series demonstrates similar rates of CVD on initial angiography in nonprogressive DAVFs and lesions that ultimately progressed. The Cognard and Borden-Shucart scales—and other scales that also rely primarily on the presence of CVD to stratify lesion risk—do not fully capture features of progressive DAVFs because new arteriovenous shunts can form and existing shunts can enlarge without necessarily changing venous drainage categories in the Cognard and Borden-Shucart systems. There have been attempts to refine classification to improve stratification of neurologic risk in patients with DAVFs.40 Geibprasert et al1 proposed a different classification scheme based on 3 craniospinal epidural spaces, noting an aggressive clinical presentation in lateral epidural fistulas in contrast to the predominantly benign presentation in ventral epidural fistulas; the predictive validity of the scheme has not yet been established. There are several important limitations to our study. This is a retrospective, single-center study during a 27-year time span. Treatment modalities and criteria for definitive management have evolved during this period. Although it is likely that embolization with a temporary agent such as polyvinyl alcohol leads to more fistula recurrences than embolization with a permanent agent such as n-BCA, the frequency of the use of particular embolic agents did not differ between progressive and nonprogressive groups in our small cohort. In addition, patients with exceptionally malignant DAVFs who did not survive the initial presentation and treatment or who refused or were ineligible for treatment would not have been identified from our data base in this series. Similarly, patients who underwent a single treatment session at our institution but had multiple prior or subsequent sessions at another hospital would have also been excluded from our retrospective review. Finally, because our institution is a quaternary care center, the duration of follow-up was highly variable; subsequent treatments and significant outcomes in the community may have been unavailable for analysis. Intracranial DAVF is a heterogeneous disease. A small subset of young patients with intracranial DAVFs follow a malignant clinical course with progressive fistula formation and expansion, intractable intracranial venous hypertension, and recurrent intracranial hemorrhage, despite aggressive endovascular and surgical management. Better characterization of the molecular mechanisms underlying angiogenesis gone awry in runaway DAVFs is necessary and will potentially provide insight into new medical therapies for this rare and serious disease. Disclosures: Steven W. Hetts—UNRELATED: Consultancy: Stryker Neurovascular, Silk Road Medical, Penumbra; Stock/Stock Options: ChemoFilter, Medina Medical. Christopher F. Dowd—UNRELATED: Other: MicroVention/Terumo,* Comments: Chief Adjudicator, Flow Redirection Endoluminal Device Trial. *Money paid to the institution. Accepted after revision February 5, 2015.